If you are anything like an average person, the bathroom will be your favorite place in the house. And no, it’s not weird to accept it now. After all, it is the one place that offers you the most relaxation (again, nothing weird about that). When we talk about bathrooms, the thing that comes to mind is showers and bath tubs. What we often neglect is the beauty and significance of wash basins. But we seldom pay much mind to the designs of wash basins. Have you ever thought that a few curves and colors would render your basin a look and feel that is rich and classy. For your dream of a perfect bathroom to come alive, you will need a basin to match the magnificence of your bathroom décor. 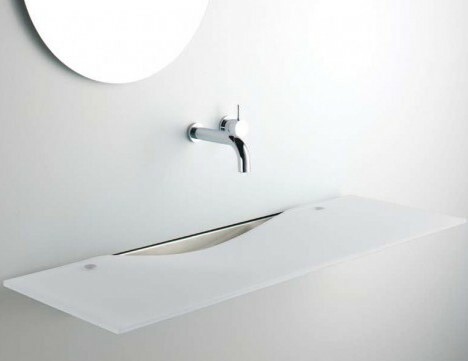 And wash basins can be made from a variety of materials including, but not limited to, cast iron, glass, marble, wood etc. It can be custom made according to your specific design requirements, and material specifications. This article will showcase some of the select designs from around the world, along with pictures to look at. So browse through them, and select the best for your dream bathroom! This one is a very playful design. Simple, yet elegant. The basin design features a stylish health cow pattern, with brown spots on pure white back drop. This can be used on corners to create an aura of freshness and the best part is that it occupies only a moderate amount of space. If you’re in for a whole new level of experience, match your accessories with the same design and watch the place light up in playfulness! 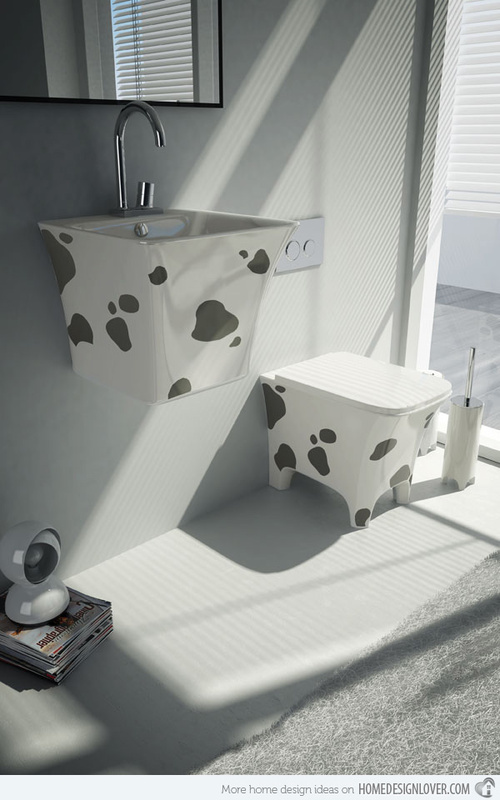 From Germany, comes this beautiful charcoal design of a basin that is sure to keep heads rolling! The faucet used here uses a sleek minimalist design to captivate your attention, and that is not even the best part yet! 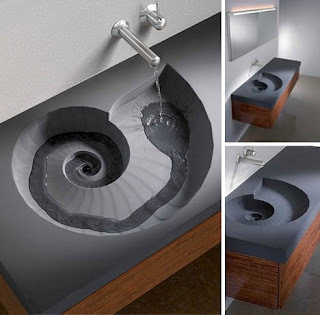 The sink is a gradually rolling spiral design made of concrete, in a solid charcoal color that blends extremely well with the wooden bottom imparted to it. If you’re feeling extra creative, you can always create the bottom wooden part a place to store your necessary essentials and save up some space! What fun it would be to take this one for a ‘spin’! This one is an absolute beauty to behold! The Swan vessel sink resembles, as the name suggests, a swan! Made of pure white marble, it will look absolutely exquisite if kept on a golden tile, as in the picture. If you feel the need (or even if you don’t) get a matching set and place them facing away from each other to get the magic flowing! 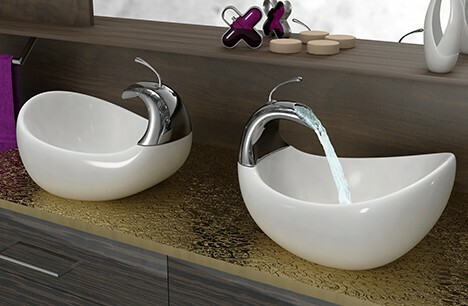 The neat and elegant minimalist design of the faucets and the basin as a whole is an immersive experience in itself! 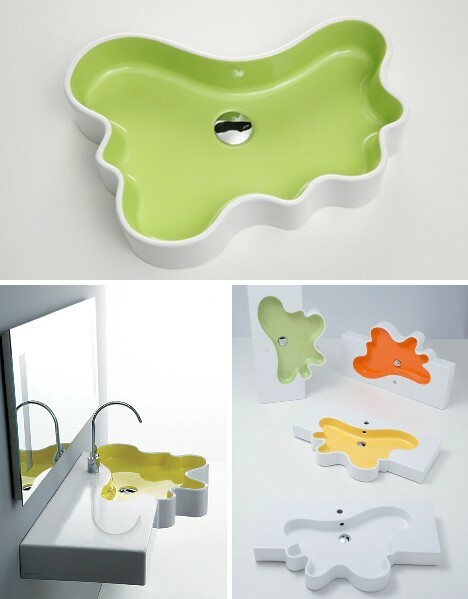 The Splash series of basins is for the child in you! This creative basin is shaped like a splash, literally, that is very attractive to look at. The appeal of this basin is the wide variety of colors that you can experiment with. To class things up, you can use colored hangers as towel holders, or a mirror with a colored border to match the splash. 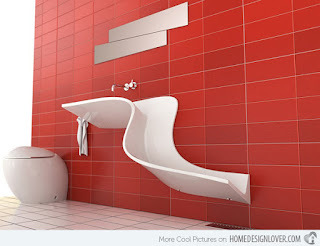 So take a break from the monotonous design of your bathroom and add a splash of colors to it! 6. Pick it, Sink it! To every homemaker’s delight, this one here is a multipurpose sink that will serve you pretty well. This is a portable sink. But don’t worry. It will not be wet when you transport it. Specially engineered, this sink sits on the top of a base. And when you need to move it elsewhere, simply lift the sink and move it. Added benefit, you ask? Well. It has drain holes that you can close and open at will! So take it anywhere you want without spilling a drop! 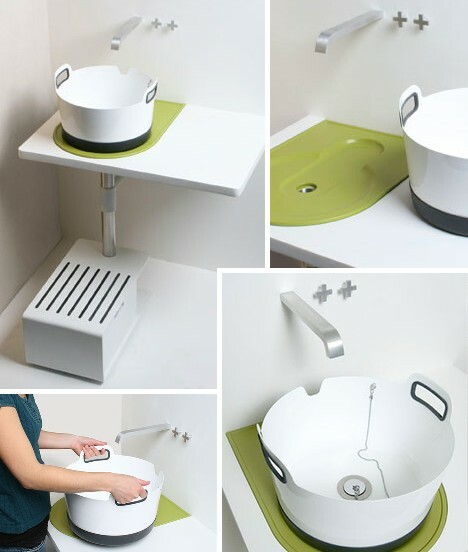 You can use it as a wash basin, or even in the kitchen, it will serve you anywhere you want quite deftly. This sink is a marvel in itself. The Mystic River Sink is to be set at the center of the setting, to emit the magnificence it boasts. It is available in a wide variety of designs, and features a gradually sloping bowl from the faucet of the sink to the drain. It is quite an unusual design, and by far, the most exuberant. To class things up, the counter of the basin can be adorned with decorations such as glass marbles. It will require a large amount of space, but is sure worth all the fuss! This one is sure to attract the attention at your next house party. Make way for the admirers! Lo and behold! This is simplicity at it’s very best. A plain solid bar and a bowl. The two key ingredients that are required to make a sink. 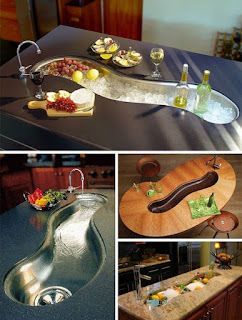 And this one is a wonderful sink made out of the same. 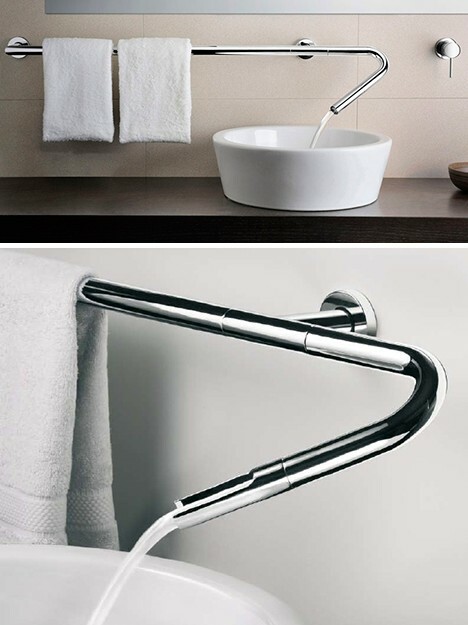 It occupies very less space, and the faucet doubles up as a place to hang in your towel or clothes. The sleek minimalist design is absolutely stunning in its cream color and modest backgrounds. This is, erm.., a weird design, to say the least. Yet, absolutely gorgeous. Named ‘Abisco’, this beauty of a sink features curves that are pretty elegant and admirable. The white color of the sink perfectly balances the cherry red color of the tile work in the background, making it a beauty to behold. The design sure makes you think and feel like a royal! And don’t worry about the splashing of water. It is engineered in a design that controls the slope of flowing water to a gentle pace. Do you have of those cute little bathrooms with space a bit too small to put in all you need? Are you plagued by accessorizing decisions? Well, this sink is a boon for those with a small bathroom that leaves little space for much else. The design boasts of space saving out and about. The sink is where the flush is, and that is what makes it a space-saving sink. So you won’t have to compromise on the looks of a sink, and put in some new stuff in the space you save from the sink! 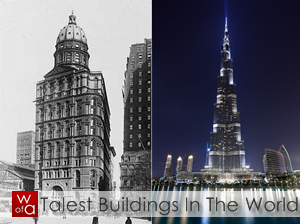 This design very nicely sums up the architectural marvels that have graced our times. Who knew that a very simple sheet of marble, and plain as that, could give such a wonderful finish to your bathroom? Presenting to you, the Onda Washplane. This one is sure to make you doubt the conventional looks of a sink. Going beyond all the traditional make up of sinks, this is precisely and carefully engineered to direct down water using only the force of gravity for help. Add a nice circular mirror to enhance the looks of this marvel. The beauty in glass or marble is yours for the taking! 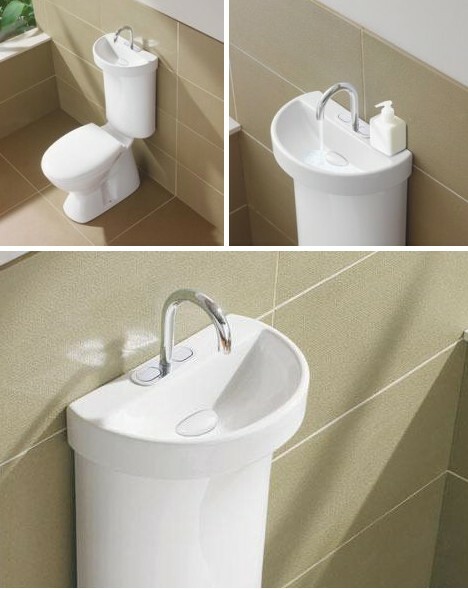 Bet you’d never have though that such a wide variety of wash basins existed! We got you shocked, didn't we? So have fun in an all luxurious bathroom of yours!